The Pedestal Urn/Flag Case combination is a beautiful way to memorialize your loved one who served in the armed forces. Societies around the world have used urns for thousands of years as an alternative to burial in the ground. The combination we present here is made of heirloom Walnut and has a 225 cubic inch capacity accessed by a removable bottom panel. If you have a veteran in the family who desires to be cremated, a flag case with an attached urn is the perfect way to show respect for those of us who proudly served our country. 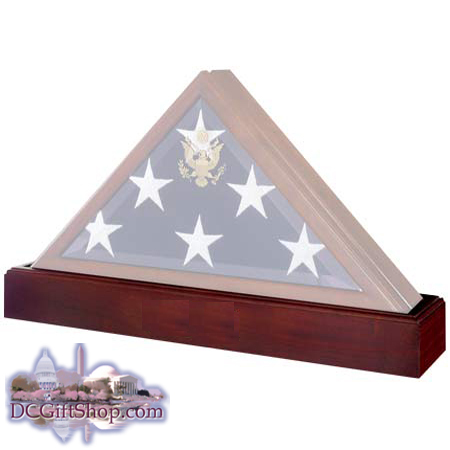 The flag case/urn is a great way to preserve a flag and ashes from a fallen loved one for generations to come. Made of solid heirloom quality walnut, this flag case/urn combination has the Presidential seal engraved on the glass which is also beveled on each edge.Honor those who served our country with pride.